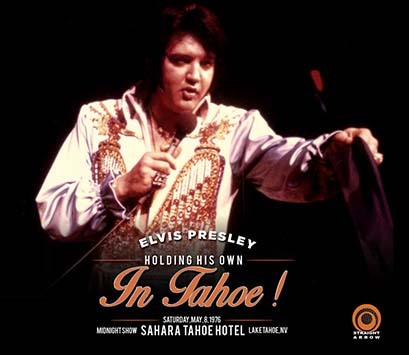 La Straight Arrow ha anninciato l’uscita di un nuovo doppio cd intitolato “Holding His Own In Tahoe!” con il concerto inedito dell’8 maggio 1976, midnight show a Lake Tahoe. 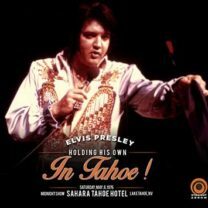 Di questa data, nel 2004, l’etichetta SAH ha pubblicato il dinner show con il titolo “A Night At The Sahara” ed entrambi i concerti fanno parte dell’ultima stagione che Elvis fece a Lake Tahoe dal 30 aprile al 9 maggio 1976. 01. Introduction: Also Sprach Zarathustra – 02. C. C. Rider – 03. I Got A Woman / Amen – 04. Love Me – 05. If You Love Me Let Me Know – 06. You Gave Me A Mountain – 07. All Shook Up – 08. (Let Me Be Your) Teddy Bear / Don’t Be Cruel – 09. Tryin’ To Get To You – 10. My Way – 11. Polk Salad Annie. 01. Introductions of singers, musicians, orchestra – 02. Early Morning Rain – 03. What’d I Say – 04. Johnny B. Goode – 05. Drum Solo (Ronnie Tutt) – 06. Bass Solo (Jerry Scheff) – 07. Piano Solo (Tony Brown) – 08. Electric Piano & Clavinet Solo (David Briggs) – 09. Love Letters – 10. School Day – 11. Hurt #1 – 12. Hurt #2 – 13. Fever – 14. Softly As I Leave You – 15. My Heavenly Father Watches Over Me (Kathy Westmoreland) – 16. Danny Boy (Sherrill Nielsen) – 17. Hound Dog – 18. Introduction of Vernon Presley – 19. The Wonder Of You (with false start) – 20. Hawaiian Wedding Song – 21. Mystery Train / Tiger Man – 22. Can’t Help Falling In Love – 23. Closing Vamp.